This year’s choir fundraiser has begun! All choir students received information in class about the fresh fruit and food items they have the opportunity to sell. Each student’s profits are deposited into their individual choir activity account. Students typically use these funds to help pay the cost of choir tour in 11th and 12th grade. Click here to view this year’s product brochures, including the fruit pricing list. Thank you for supporting our choir students’ activities! 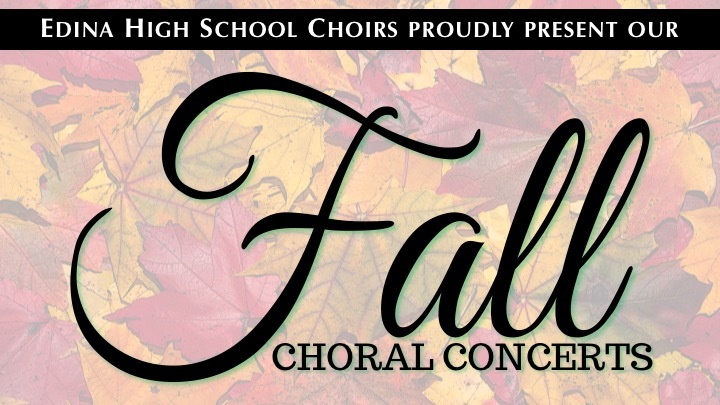 The Fall Concerts will be presented Monday, October 15 and Tuesday, October 16 at 7:00pm in Fick Auditorium. Tickets are $5.00 and all seats are general admission. Tickets may be purchased in the Commons beginning at 6:15pm each night. The concerts will be streamed live on the Edina Choirs’ YouTube Channel. 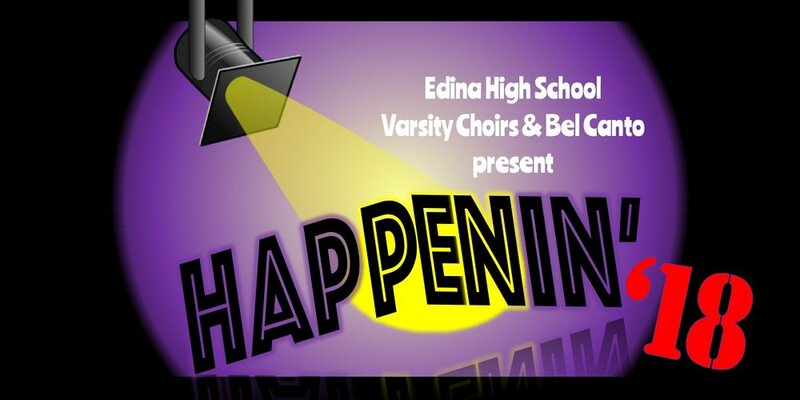 Edina High School's Varsity Choirs & Bel Canto proudly present Happenin' '18 on Thursday, May 17 & Friday May 18 at 7:00pm in Leo J. Fick Auditorium. Come see and hear our energetic spring concert, filled with singing and dancing, a variety of small ensembles and soloists, and some of our favorite well-known songs. Public ticket sales begin online on Monday, May 7. Stay tunes to edinachoirs.org and facebook.com/edina choirs. Registration for incoming 9 - 12th-grade students at Edina High School will occur February 8 - 22, 2018. Please see our updated Registration Information page to learn more about the options for EHS students to participate in the choral program. All Edina High School students who participate in school-sponsored activities, including athletics and fine arts, must complete the annual registration that satisfies both EHS and MSHSL requirements. Curricular choirs (choirs that meet during the school day) have no activities registration fee in this process, but online registration must be completed by December 1. Please use the following directions to complete your student's registration by December 1. If you have questions regarding the registration process, please contact the EHS Activities Office. Thank you for your help completing this important requirement for our students. Login Name= Student ID Number (6 digit student id number). Password = Student's date of birth (6 digit format, no dashes). As an example a birth date of May 1, 2000 would have a default password of 050100. Edina Choirs' annual Fruit Sale Fundraiser began on Monday, October 23! The profit that each student makes goes into his or her individual choir activity account, and can be applied toward choir expenses such as tour fees. We encourage you to view this year's catalog and order form, and place an order through your choir student! Delivery of products is scheduled for December 11. Tickets will be sold beginning at 6:15pm both evenings in the Commons outside Fick Auditorium. If you are unable to join us in person, view the live stream: click here. Edina Choirs is happy to welcome the Purduettes of Purdue University as they present a concert on their Minnesota Fall Tour, as well as visit Edina High School. Welcome to the new Edina High School Choirs website! Just like the change to our new web presence, this school year marks significant changes to Edina High School and our choral program. For the first time, all ninth grade students will attend EHS, and we are excited to add Ninth Grade SSA and Ninth Grade TTB choirs to our department. Please visit this website often, as it will continue to grow and evolve.